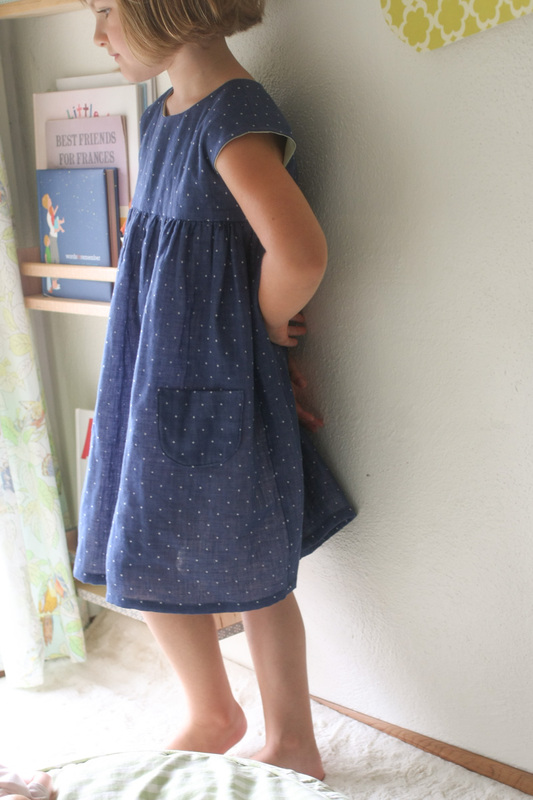 As soon as I saw Kaufman’s Lush Velveteens, I knew I wanted to sew this dress for Lila. 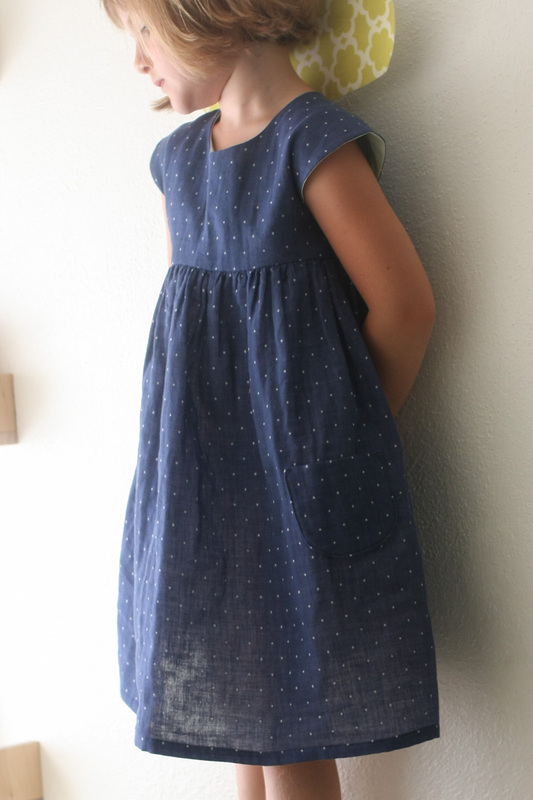 The Geranium Dress pattern was an easy choice – it’s fast and simple, it always fits well (this is a 6 with some added length), and most importantly, it has Lila’s long-standing seal of approval. 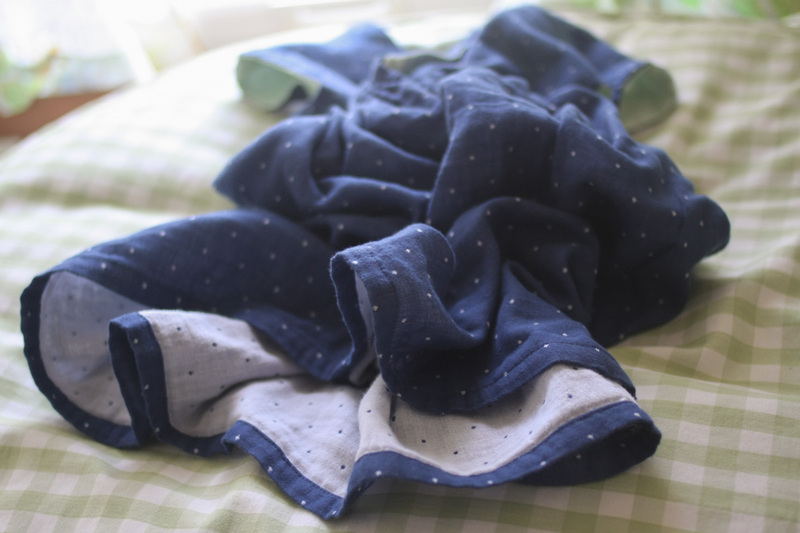 Velveteen is great because it feels a little bit fancy while still being 100% cotton, which is really what I prefer to use for kids’ clothes. And I couldn’t resist this color. I decided to go with blue and gold and get it finished in time for Hanukkah so she could wear it all month long, which she did. The bodice is lined with Morn’s Rays in Gold by Eloise Renouf for Cloud 9 Fabrics – I wanted something with a little metallic gold in it (of which there are many great options these days) to go with the sparkly gold trim, which I found locally at Fabric Depot. I added the trim after the dress was finished and tucked it under at the back edges. Lately I can only get motivated to sew when I have a very clear vision of what I want to make and I’m fully invested in the end result. It doesn’t happen as often as I want it to. I had every intention of making Christmas pajamas this year, but I ended up buying them. It wasn’t that I ran out of time. I spent hours looking at patterns and fabric, but I couldn’t pull the trigger – nothing was really doing it for me. I don’t want to make just for the sake of making, you know? I want to sew something I’m really excited about, something I can’t wait to see come together. I definitely sewed less this year and that trend will probably continue, but I’m hoping what I do sew will be well thought out and satisfying. I hope everyone’s holidays were wonderful. Happy 2016 from these guys! We’re at that point in the summer where despite the heat, sewing warm weather clothes doesn’t make much sense anymore. 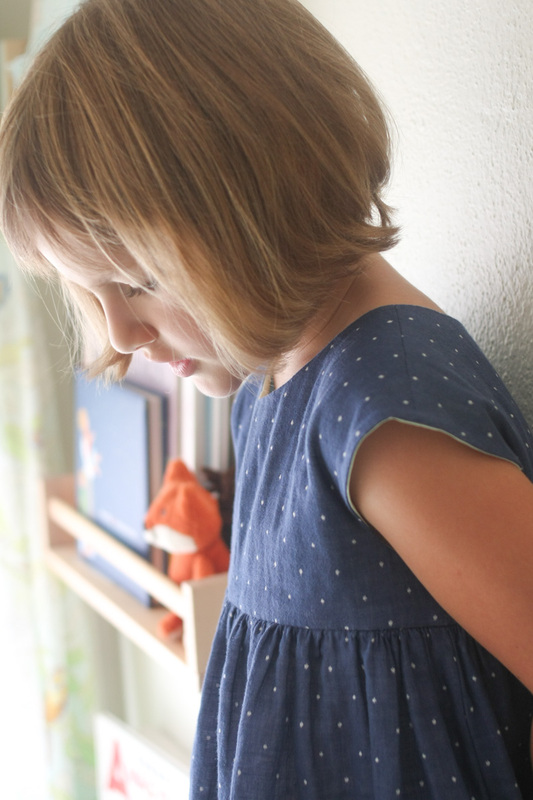 Kindergarten starts in less than three weeks, and the list of things I want to sew for fall just keeps growing. I guess this is sort of an in-between dress – the navy feels like fall, and the double gauze is light and summery. 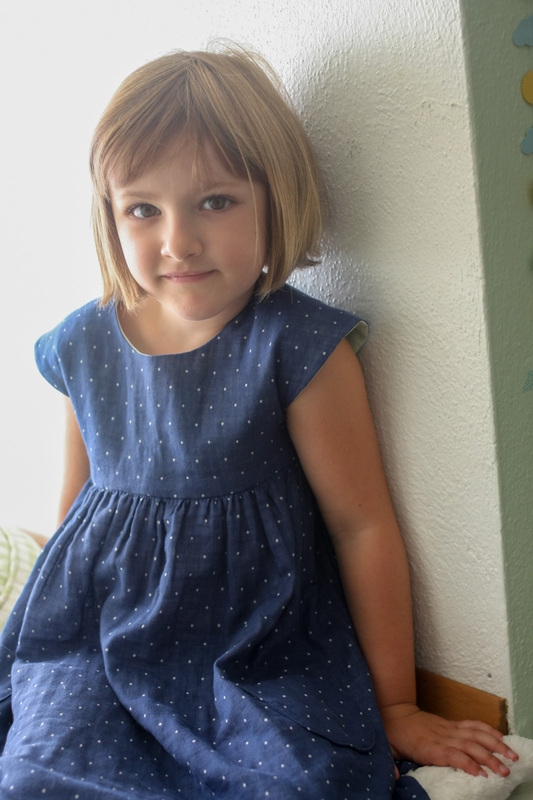 And Rae‘s all-mighty Geranium Dress pattern is just right for every season, of course. The Geranium is far and away Lila’s favorite dress to wear. These two (and especially that first one) have been in constant rotation for a full 18 months now. Her devotion to that Amy Butler number has been especially unwavering – we’re talking at least once or twice a week – pretty much whenever it’s clean and I’m not able to talk her into something else. They’re both nice enough dresses, but it’s seriously starting to hurt my eyes to see her wear them. They’re just a tad short, too, like about three inches above the knee. It’s been time for new Geraniums for a loooooong while. 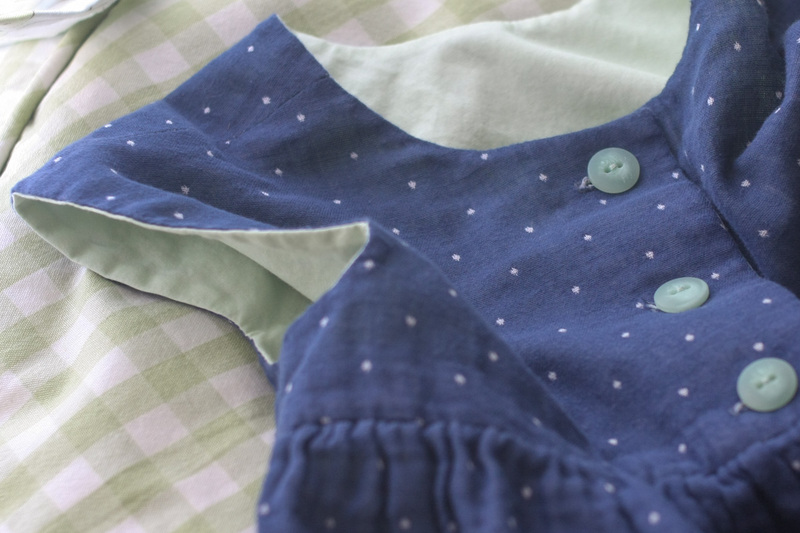 I couldn’t bring myself to do anything but those cute little faux cap sleeves, but this time I sewed view A from the waist down – gathers and patch pockets. Gathers seemed like the way to go with double gauze. The bodice is lined with Art Gallery Pure Elements in Sweet Mint, which I dare say is the perfect shade of mint green. And mint buttons to match. 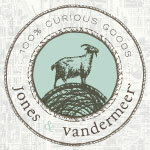 I found the double gauze (made by Pickering International) at a great little local shop called Josephine’s Dry Goods. 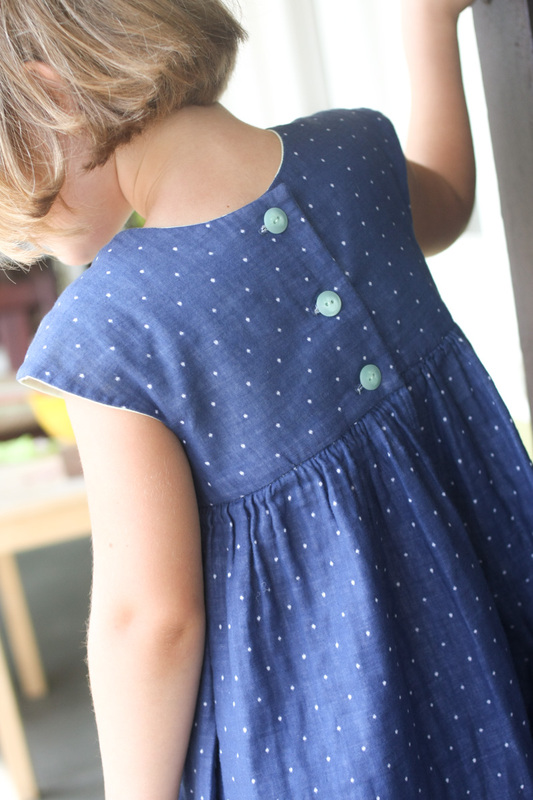 It’s beautifully soft and reverses to white with navy dots on the other side. I only bought one yard, but luckily it’s 56″ wide and I was able to squeeze a size 5 out of it. Just barely. Anyway, there’s not a whole lot I can say about the Geranium pattern that hasn’t been said before – it’s great! Your kid (if she’s anything like mine) will love it! I’m off to make a few more.